What causes Decalcification of tooth enamel? The plaque that builds up on the surfaces and between your teeth creates acids which remove your tooth’s enamel over time. Tooth decalcification is a process by which the tooth loses calcium. It’s generally considered an early stage of tooth decay. What are the signs of tooth Decalcification? 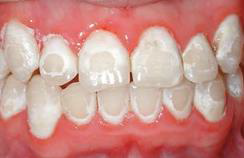 White spots are the first visible sign of tooth decalcification. The best way to prevent Decalcification is to keep your teeth clean of plaque. This can be done most effectively with proper brushing and flossing. We recommend brushing at least 2 times a day for a duration of 2 minutes or more each time. Brushing in small circular motions can really help reduce the presence of Decalcification.